Kevin Wilson has a fresh, quirky and original voice. This is an enjoyable and easy read with a bittersweet storyline and interesting, flawed characters. 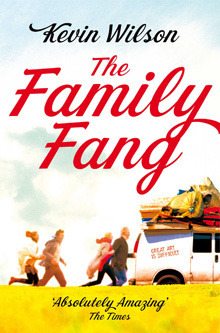 The novel explores the question of what is more important art or family? The conclusion drawn is both sad and uplifting and makes this a very original read. Buster and Annie are a brother and sister in their 20’s both struggling to overcome their peculiar upbringing and escape the shadow of their eccentric parents. Their journey is funny, sad, moving and inspiring. I would highly recommend this novel, it manages to balance a thought-provoking and clever idea with a light, satirical writing style. I’ll definitely look out for any novels Wilson writes in the future. N.B. Despite the slightly deceptive title, this book doesn’t have anything to do with vampires!